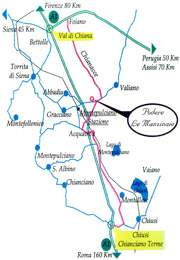 Glicine apartment is located in the centre of Italy, in Tuscany, in the Commune of Montepulciano, in the province of Siena just halfway between Florence and Rome. It is in restored farmhouse, built in 1878. 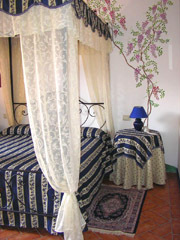 The apartment/suite “GLICINE” is a romantic apartment for two people, it is on the ground floor with its own entrance. A fully equipped kitchenette, with a gas stove top that has different sized elements, so you could pick one to suit the pot and not flames leaping up the sides; fridge, microwave oven, American Style Coffee machine and toaster. In the dining room there are: a table that could be extended with some chairs; 2 armchairs and a little table, where you can sit drinking a glass of red wine, typical to the area of Montepulciano and you can relax reading a book, by candle light. A bedroom with matrimonial canopy bed and ceiling fans. A bathroom with Jacuzzi hydro massage tub, separate shower, hair dryer and double washbasin.